Summary: Loggerhead nest numbers in Florida have been declining since 1998, raising concern among the scientific community and the general public because approximately 90% of all loggerhead nesting in the Southeastern U.S. occurs in Florida. The reasons for such decline are unknown. As population estimates are based on nesting activity, the decline in nest numbers may reflect a decline in the adult nesting population. However, reduction in nest numbers might reflect a change in the relationship between feeding ecology and reproductive output (for example, adult females may not find enough food or enough good quality food to allocate resources to reproduction as often as in the past). 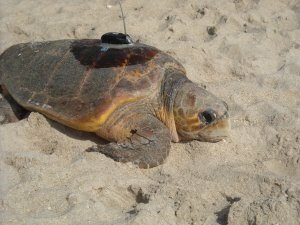 This project will investigate reproductive parameters, movements and feeding habits of loggerheads nesting at the Archie Carr National Wildlife Refuge (ACNWR) using a combination of FastLoc GPS/Argos satellite tags, VHF radio tracking and stable isotope analysis.